I have always loved road trips. Open windows, music loud, the endless road sprawled out before you. 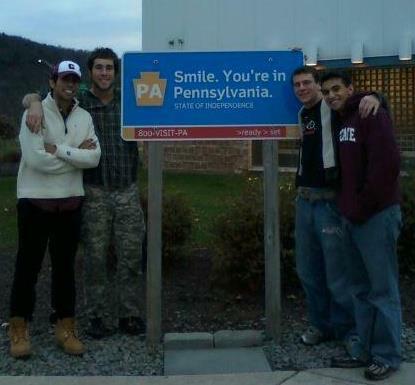 Over fall break of my Sophomore year, three of my fraternity brothers and I decided to drive from Hamilton, New York to the neighboring New Jersey and Pennsylvania borders for photography’s sake. The trip was spontaneous and only lasted one night, but I will never forget how refreshing it was to escape to the scenic pastures of the Garden State and finally breathe the free Newark air again. We drove without stopping and enjoyed good conversation and music. On August 21st, eight days before the start of my Senior year, I decided to make another trip. This time, I traveled with two more of my brothers back south to New Jersey. We headed down to the shores of Cape May to visit Vic Krivitski, a brother of ours who had just been placed in hospice care after an eight-month battle with cancer. Although Vic had traveled with me the last time I braved the New Jersey border, I would be making the return trip without him as we had been told he had no more than two or three days left to live. We drove without stopping and enjoyed small talk and rain. Upon reaching Vic’s house, we were greeted by a collection of his closest friends and family. Everyone extended warm hands and smiles, but was noticeably fraught with the approaching death of a man I had once joked was the product of a government experiment mixing centaur and human DNA. A year ago, Vic’s 6’4” frame carried a hefty 240 pounds. Now, he was a skeleton of his former self, shackled like a shadow to a wheelchair. The man who could scale any rock frontier and flatten anything on the rugby pitch was 70 pounds lighter and needed help drinking, eating, and walking. He spent the afternoon with us, making sure he got in a final round of brews with the boys. I can see him now, struggling with a straw in his mouth, seated with his Heineken besides me. Despite his characteristic stubbornness to stick it out, Vic was eventually convinced he should rest up and save his strength. He was wheeled off to sleep. That evening, we sat outside and shared Vic stories and wine. We talked for hours about the guy who hid a snake named “Kitty” in his room freshman year and loved to ballroom dance with his beautiful girlfriend, Natalie. Jealous that we were having all the fun, Vic was wheeled out by his mother and did his best to stay up with us. Fighting hard to speak through his respirator, he soon grew tired and had to return to bed. We helped him into what had become of the living room and said goodnight. The Krivitski family had been kind enough to offer us several guest rooms in their home. When we headed for sleep, I decided to crash in Vic’s old room instead. I wanted to know the books, swords, and ghillie suit hanging above his childhood bed as he had known them. Not much of a climber myself, I chose to sleep on the mattress rather than in the hammock he had strung up on the ceiling. I lay in a state of half-sleep that night, that peculiar shade of restlessness where you aren’t sure if your thoughts are born from you or the echoes in an empty room. This bed might have belonged to anyone, but it was for the friend who lay a dozen feet beneath me, drifting in and out of sleep. When day broke on August 22nd, my brothers and I roused ourselves and left in search of McDonald’s before hitting the road. When we returned, Vic was still asleep. We exchanged several hugs with his mother and his best friends before going to say goodbye to him. He was half-propped up on his hospice bed, still in tubes and blankets. What can you say? I handed a letter I had written him the day before to his best friend, a letter that he would never read, but whose words I somehow hope he knew anyway. We kissed him on the forehead and took our turns telling him how much we loved him, and then we got back into the car and began the long drive back to Hamilton under clear blue skies. At noon, two hours after our departure, we got a call informing us that Vic had just passed away. I remember being less surprised at the news than by the fact that the heavens had not opened up and mourned the loss of their greatest son by raining fiery meteors down on the plains of New Jersey. The summer day remained as it had been. The sun still shone, the traffic still flowed, and the dirty air of the Garden State Parkway still smothered us like a toxic gas. Even though the world was suddenly without the legendary Vic Krivitski, it was somehow exactly the same. It felt selfish to spend such a beautiful afternoon grieving over our loss when we knew that he would not have wasted a minute of summer sun for anything. Still, the weight of the news lingered in the car. What can you say? Breaking the silence, I recounted with a smile how Vic and I had lived on the same dormitory floor Freshman year. The first night I met him, we had been hanging out with a few guys in a common room. The conversation turned to Fight Club as it always did, and Vic began challenging a few of the other guys to a fight. Although I had never thrown a punch before, much less at anyone twice my size, he had this aura about him that made me feel safe in his very large and capable hands. I alone responded to his challenge. He laughed, and then hit me square in the face. Several blows later, I emerged defeated in the world’s shortest boxing match. He helped me to my feet, said with a grin, “You’re a man now,” and then handed me one of his roommate’s beers. For the next week, I wore my black eye around like a badge of honor. I will never be able to do justice to the feeling of satisfaction I got from answering inquires about its origin with a casual, “Yeah, I got it from Vic.” We all laughed and continued to swap stories as we drove towards that ever-retreating horizon that, for the first time, didn’t seem as far away. The journey down to Cape May was the hardest drive any of us have ever had to make. Saying goodbye to a friend who was taken much, much too early from the prime of his life is not a situation I would ever wish upon anyone, but making that drive down there was the easiest decision I have ever made. The trip was never about us, but about providing as much love and support as we could to the man who had given every last one of his breaths to make those around him happier. For the time we lost, I will forever feel longing. For the time we had, I will forever be grateful. Vic Krivitski lived every day of his life in an unwavering show of devotion to those around him. He embodied the traits of loyalty, friendship, and leadership better than any man I know. Some have chosen to call these attributes selflessness. Posted in Adventure and tagged Brothers, Cape May, Fight Club, Fraternity, Road Trip, Vic Krivitski. Bookmark the permalink.